Israeli settlers, on Sunday morning, again stormed the courtyards of Al-Aqsa Mosque in East Jerusalem, amid heavy security procedures. 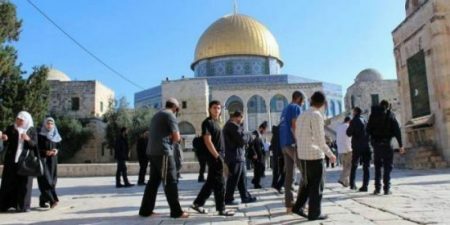 Jerusalemite sources said, according to Al Ray, that 19 settlers stormed the mosque via the Mughrabi gate and carried out provocative and suspicious tours in the courtyards. Colonial settlers regularly storm Al-Aqsa under police protection, in an attempt to divide the mosque temporally and spatially. Only two days prior, Jewish Israeli settlers spray-painted anti-Palestinian graffiti on walls and torched a Palestinian-owned vehicle, after raiding the East Jerusalem neighborhood of Beit Safafa.